Our stock footwear displays are designed to hold a variety of footwear products, including shoes, athletic footwear, sandals, flip flops, boots, and more. All of our stock models feature a combination of metal and wood, and all of them are configurable to allow for multiple merchandising options. 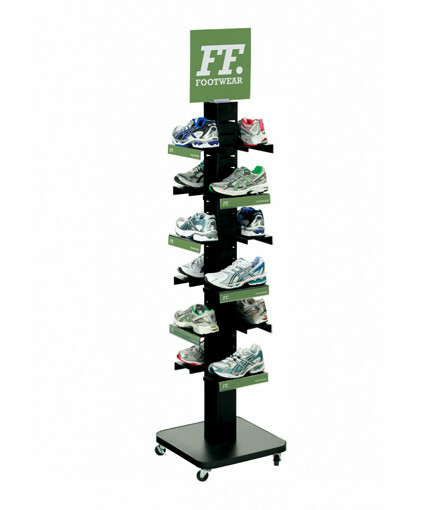 We offer footwear display accessories, including shoe shelves, hooks of various lengths, and header sign holders. Our stock displays include a mobile tower model with adjustable shelves which is merchandisable on 4 sides, a 2-sided grid display that utilizes hooks for hanging footwear, and a 4-sided multi-product apparel fixture that can be used to cross-merchandise footwear with other apparel products or that can be configured as a footwear-only fixture. Our footwear displays knock-down which makes them economical for shipping and storage. They can all accommodate header signs and additional branding as required. 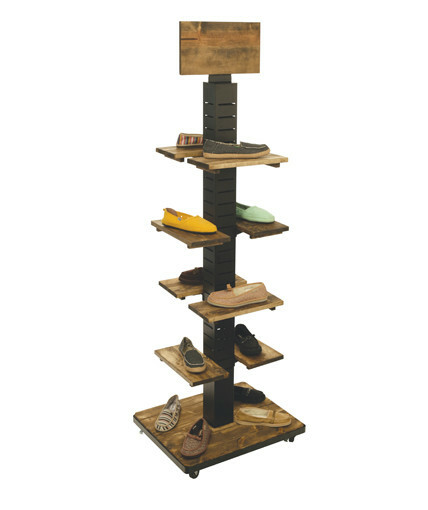 Our footwear towers feature a small footprint, and all of the footwear fixtures in our stock line can fit within a variety of retail environments, including apparel stores, specialty shops, mass market retail stores, sporting goods stores, surf shops, boutiques, and other types of stores. We offer in-house printing services to help you brand any of our stock fixtures. If you don’t find a stock fixture that works for you, let us know, and we can design a custom footwear fixture that meets your needs.